Dawn is the graphic designer. She manages the sales, designs the signs and gets them ready for production. She particularly enjoys designing colorful, whimsical and unique signs. Some of her favorite projects involve a design element or idea brought in by the client that she can expand into a beautiful piece of artwork that tells a story as well as a label marking a home or business. Dawn started designing as a child when she would draw architecturally inspired model towns. After graduating college with a degree in biology, she took life-drawing classes at the Provincetown Art Association, did workshops with Cynthia Packard at her Provincetown studio, oil stick classes with Pia McKenzie in Orleans and drawing classes with Jim Owens of the Glass Eyes in Eastham. She is a fan of the technique of “drawing from the right side of the brain”. When Dawn became a mother she started painting to take time for herself after long joyous days caring and growing with and for her four beautiful children. Now that her children are grown, Dawn still paints for her own enjoyment and relaxation. She feels lucky because her profession is artistic in its self and allows her to be creative all the time. Dawn has lived on Cape Cod for most of her life, she has also lived in Boston & New York. Currently she is looking forward to show casing both her paintings and drawings. Dawn and Susan have recently opened Art Gallery 91 within the sign studio displaying their art in the sign shop in Orleans. 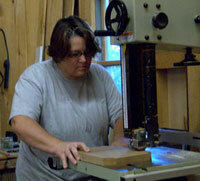 Susan works on the production side of the shop. She sands, primes, paints and carves signs after Dawn designs them. As you walk into the shop she is the first to greet you, smiling and lightly speckled in the days paint color. Her projects lay out drying or waiting to be carved for clients to take a peek at the production process on their way upstairs to plan their own new sign. 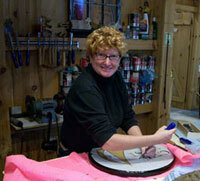 Susan enjoys fishing and this is reflected in her sign art and in her personal artwork. She is excited to make more house signs because she thinks everyone should be surrounded by everyday beauty and gorgeous features. Also an avid painter and drawer, Susan received second place for best in show for the Council on Aging Art Show 0f 2008. Currently, November 2009, Susan’s art, (better known as SLYART), has been displayed at Cape Cod Five Cents Savings Bank in Orleans. More of her artwork is in the sign shop, Art Gallery 91 at 91 Eldredge Parkway. Most of Susan’s artwork revolves around the nautical, dogs and the absurd. She prefers to paint fish, animals and some human-like characteristics some of which are finely detailed and all very interesting!